BirdRing default uses Google Maps. However, this only works when there is an internet connection available. To use a map without internet connection, BirdRing can use offline map files that you have preloaded on your device. You can activate the use of offline maps BirdRing menu: tap the three dots in the upper right corner and then choose Settings. Then you are guided to download a map of the country of your choice. You can also download multiple map files. Map files of some countries can take up quite some space on your phone or tablet. For the largest countries, you can choose to download one or more smaller regional map files instead. The map files are based on OpenStreetMap data. Do you recognize this: you are in an unknown place and an hour or two to spend. Of course you would like to read rings. But where to find them? The BirdRing SpotFinder helps you discover good spots to read rings. The SpotFinder shows locations on a map where different species have been read before. When you move the map or zoom out, use the refresh button in the right top corner to show additional observations. You can find the SpotFinder in the menu (three dots) in the right top corner of the home screen of BirdRing. Observations in vulnerable areas (e.g. breeding colonies) won’t be shown. Contact me if you want me to add a vulnerable area. 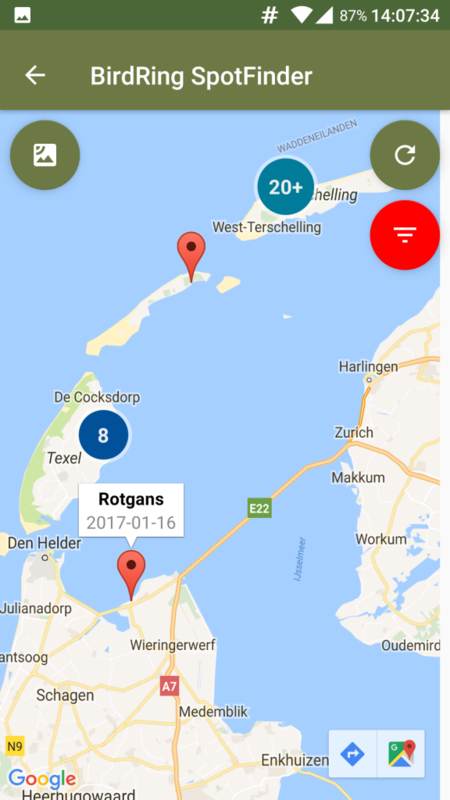 The SpotFinder uses observation data that have been collected with the BirdRing app: just species, date/time and location will be collected by the SpotFinder and only if the user explicitly gives permission to collect the data. The SpotFinder does not collect any ring data (that is only for the researcher) or personal data. Anyone that does not want the SpotFinder to collect his data, can keep using BirdRing as usual, without using SpotFinder. With BirdRing you can easily capture your observations. BirdRing determines the right ring code and stores location, date, time and many other data. BirdRing prevents common mistakes, like unused letters or colours. 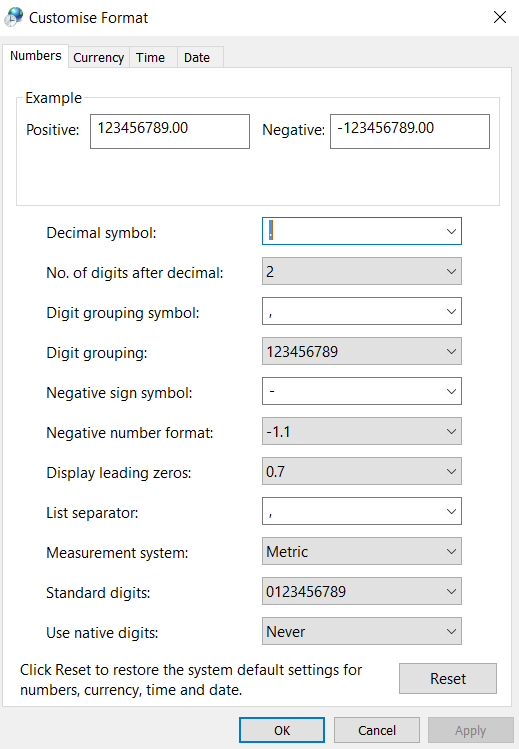 You can upload the observation data to connected websites and you can email observations to yourself in csv (Excel) format. BirdRing directly shows the ‘life history’ of birds that have been uploaded to connected websistes. The primary objective of BirdRing is to simplify administrative actions around collecting and submitting observations of birds with colour or metal rings. BirdRing saves time, that you can spend to go out birdwatching more often or other things you like. By making things easier, BirdRing hopes more observers join in collecting and submitting observations. BirdRing also prevents mistakes, by several checks in the app and because you don’t have to copy data from your notebook into your computer. And last but not least: it’s just fun, like viewing the life history of birds after uploading the observation data to a connected website. The most important functions of the app are briefly explained in this PDF with screenshots. How do I submit observation data to researchers? Upload to websites: BirdRing is connected to some major websites. By clicking the cloud icon in the home screen, BirdRing will send suitable observations to the right website. It does require that you have an account at that website. BirdRing will ask you to enter your account data (user name and password) and store them in the BirdRing settings. By hand from your computer: search cr-birding.org how you can send your observation data. Very often it is an email address. In such cases you can attach the BirdRing CSV attachment. Some researchers can process the CSV (semi) automatically. That saves time for them and for you and it prevents possible errors while copying data by hand. BirdRing does not collect any personal information. Period. BirdRing uses the gps location of your device only to show you the map of that location. BirdRing uses your email address only to let the app send you an email with your observation data. 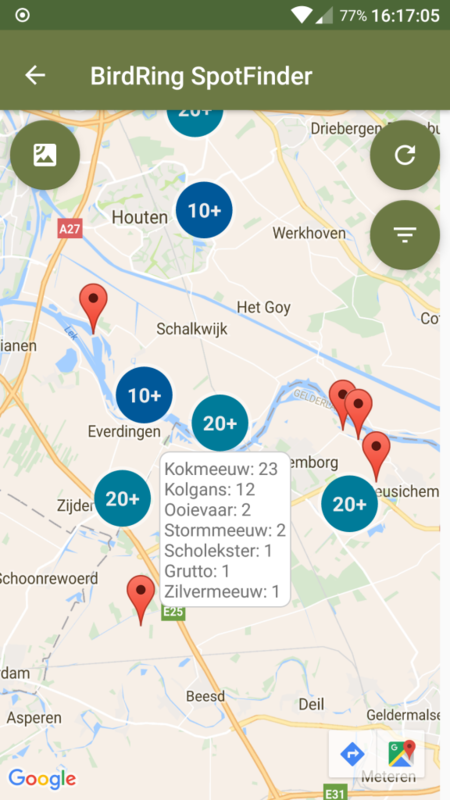 BirdRing for Android has an option to send anonymous observation data to the BirdRing SpotFinder database. These data do not contain any personal data, just the species, date/time and location of the bird you have observed. BirdRing for Android has an option to use offline maps. If you activate that option, the app needs your permission to access local files on the device. This permission is only used to load and display the map file. Can I use BirdRing without internet connection? Yes you can, for most things BirdRing works just fine without an internet connection. So you can use BirdRing on a device without a SIM card. However selecting a location on a map is kind of ‘blind’, as you don’t actually see the map, just your own position. Of course you can send your observations once you have a Wi-Fi connection to the internet. Tip: if you have another device (like an iPhone) that has mobile internet, usually you can setup a Wi-Fi hotspot that enables you to access the internet from your Android device that does not have a mobile internet connection itself. Which websites are connected to BirdRing? Other European websites will be connected in the future. Contact me for the possibilities, if you own such a website. Can BirdRing take a picture? No, BirdRing cannot take pictures. The checkbox ‘Photo’ is used to indicate that you have taken a picture of the ringed bird. This indication can be used by yourself or by a researcher, to further investigate the observation. What does ‘previous’ mean on the location screen? By pressing the button ‘Previous’ on the location screen you copy the exact coordinates of your previous observation to the new observation. That is easier to use and it has another purpose: this is the way in BirdRing to indicate that more ringed birds belong to the same group. These identical coordinates are used to group the observations in one item when you upload the observations to www.geese.org or when the CSV file is automatically processed by researchers. How can I change my favourite species? You can learn BirdRing to always show your favourite species first, so you can choose it faster. When you start a new observation, BirdRing first shows your favourite species list. You can remove a species from your favourite list by clicking the star. To add a species to your favourite list, you can add a species in the search screen (through magnifier) by clicking the star. I appreciate if you want to share your idea with me. If I think your idea is useful for more users, I shall put it on the idea list and may implement it in a future version of BirdRing. Many of the current features of BirdRing are the result of user feedback. 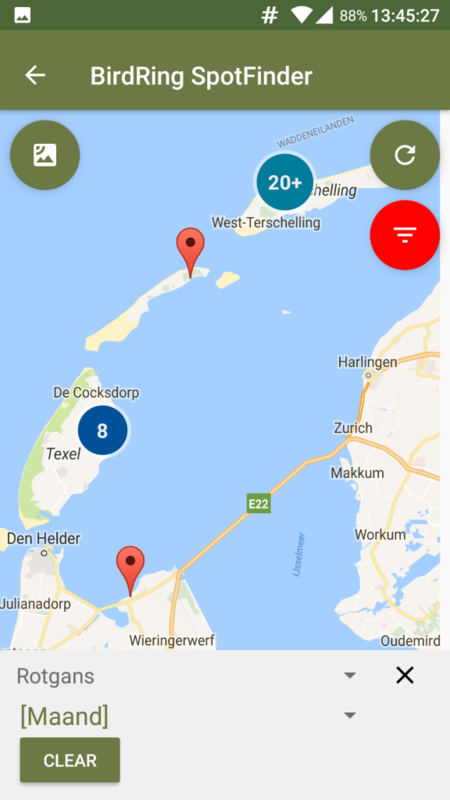 You can contact me through the email address that you can find at the BirdRing app in de Google Play Store, Twitter and Facebook. How can I enter more data? In future BirdRing versions there will be more fields for data input. You can think about relations between birds and number of chicks. Until then you can add such information through the Remarks button in the Bird screen when you enter an observation. How can I open the CSV attachment? CSV is short for Comma Separated Value. It is a common used format tu exchange data between different applications. You can view and edit a CSV file using Microsoft Excel, Google Spreadsheets of LibreOffice Calc. BirdRing uses a CSV file to send your observation data by email. 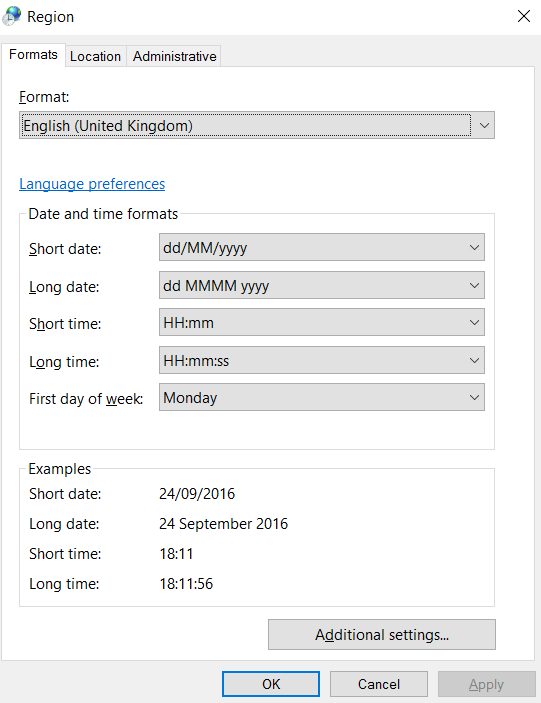 When you open the CSV file using Excel, it may happen that data are not formatted the right way. 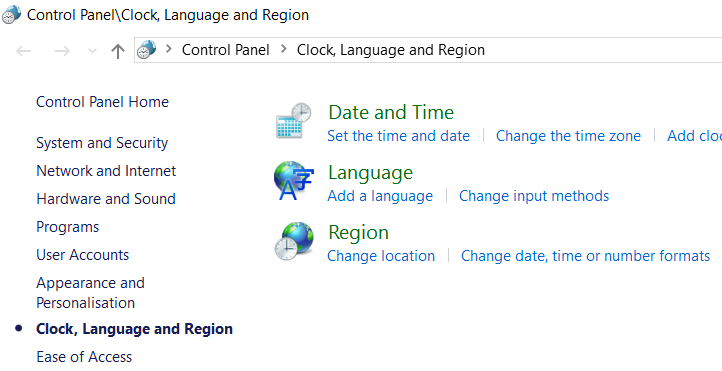 This is caused by regional settings in Windows, like Dutch. These settings doe not fit the international standard that is used by BirdRing in the CSV file. Finally click OK a few times. N.B. These changes will be active in Excel, when you first close Excel and then restart Excel. Why must I manually enter the location? By request of several researchers the observer is asked to enter the exact location of the observed bird. In certain situations it is very important to know whether the bird has been seen on one side of a road or the other. 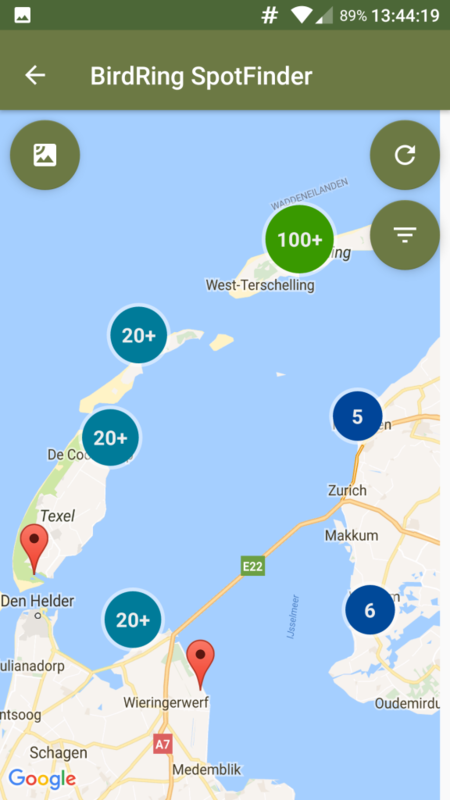 When you observe more than one ringed birds in a group, you can choose the “previous” button on the location screen. This will give the new observation the exact same coordinates as the previous one. There is an option (in settings, see three dots on the main screen) to disable the location screen completely, to make it possible for you to enter observations even faster and easier. The observation will get the coordinates of your own position. Usually not precise enough, but in some circumstances you may prefer faster input above more precision. How do I choose the right ringing system? BirdRing supports some general ringing systems and some that are tailored to a specific species. While entering a new observation, BirdRing shows the most common ringing system for the chosen species. By clicking the name of the ringing system on the bottom of the “ring” screen, you can choose another ringing system. When none of the available ringing systems is suitable, you can chose ‘Enter code’. This gives no help but all the freedom to enter a ring code. In which language is BirdRing available? If anyone wants to help translate other parts of the app, please contact me. How do I use the location description on the Map screen? When you enter the location of a bird on the Map screen, a red marker is shown. At the same time there may appear a description of the area at the bottom of the screen. You can change it as you like. The description is saved with your observation. This enables you and researchers to quickly identify the location of the observation. Using a self learning function by BirdRing. You could consider it to be artificial intelligence. 😉 This function uses descriptions that you have manually entered in previous observations. For any new observation within 500 meters from a previous observation, the area description is copied. You can override the suggestion by BirdRing. Then BirdRing will remember the new description with the new coordinates for future observations. This way BirdRing learns the names and borders of your favourite areas just by using it. Using the ‘Reverse Geocoding’ service offered by Google gives an address based on coordinates. This option is available on most but not all Android devices and only working when you have an active internet connection. When these three methods don’t give a description, you can (and sometimes must) enter a description yourself. Who designed the nice BirdRing logo?